out four-beat rhythms about a pop diva. In the rocking train, as we rounded the Passaic river, that curve of water that tells me I’m home, I just had to smile. The rail rattle seemed like a background to their song, their commentary on the world. According to TED speaker, professor, and author Dr. Kyra Gaunt, PhD, girl’s games like double dutch relate to African-American musical traditions in that they are about “exploring one’s kinetic potential and energy in a significant span of musical time and space.” Chants and the percussive, intricate movements of kicks, flips, and other complicated moves, the urging of the turner to the jumper to keep time, make for a unique art form perfected by urban youth. The young women of FloydLittle Double Dutch Team are young Newark women whose mastery of double dutch is mesmerizing to watch. Founded by Laila Little and Shaquannah Floyd, the team went on to compete in the American Double Dutch League&apos;s 40th annual World Invitational Championship, placing first in two categories, second in six and fourth in one. Then, Lifetime created and aired a documentary series about the team, an invite to perform at the White House Easter celebration and to open up the 2014 BET Awards with Pharrell and Missy Elliot. The girl’s ropes move so fast that they appear to be bands of light in some technologically augmented reality. But it’s all real, sweat and grace and skill. You won’t be able to look away. Their grace and intensity are inspiring, and the larger public recognition of their gifts as individuals and in community is so welcome! The league’s origins date to 1970’s NYC, when two police detectives organized a double dutch tournament. Vintage 1980’s footage shot by artist, documentarian and video freak Skip Blumberg can be seen on YouTube, Google his feature “Pick Up Your Feet.” The young women competing are fantastic, raw and full of life. I couldn’t help but wonder what Newark’s young women were up to game wise, around the same time. I bet they danced hard. While the league allowed professional recognition of the game as a sport, the songs sung, this aspect of girl culture, was deemphasized. So many songs, so many. Dr. Gaunt argues that discussions of commercial popular music often exclude the communal music making forms that are part of girl culture, and that in fact these traditions and their innovators are a sophisticated transmission of Black musical expression. Check out The Games Black Girls Play: Learning the Ropes from Double-dutch to Hip-hop to learn more! 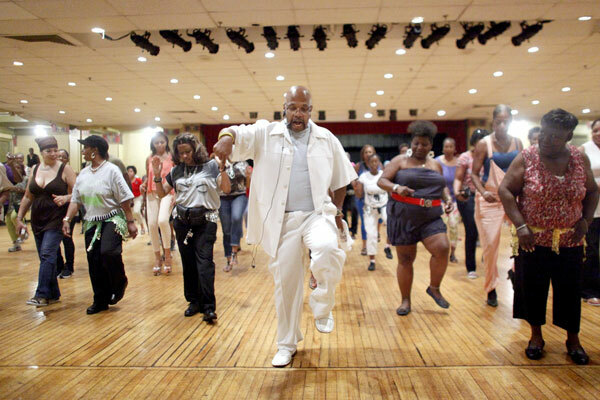 If you can’t bear to stay on the sidelines cheering on the youth, the Soul Line Dance Party at Newark Symphony Hall is the 2nd Friday of every month. See you on August 14th! This is, as they say, some serious grown folks fun. $5 (!) gets you lessons and dancing with Kenny J, Xman & Step 4 Step Soul Lind Dancers, or Najah & The Brick City Soul Line Dancers and upwards of 500 other new friends. Catered dinners are available all night till midnight, with a cash bar to quench the thirst you are going to work up. Get tickets at the symphony box office. Old school: Newark Symphony Hall, originally known as the Salaam Temple, was built in 1925 by the Shriners. Later, Lena Donaldson Griffith, of Griffith Piano fame, assumed management. When I think of the hall, the mixed Greek and Egyptian motifs in goldleaf, the enormous columns, I see a blur as the marquee letters are rearranged millions and millions of times by hand, from a ladder. It’s a blur across decades: Vaudeville, “talkies,” Arturo Toscanini, Vladimir Horowitz, Marian Anderson, William Warfield, Lily Pons and George Gershwin, dancers from Ballet Russe de Monte Carlo and the New Jersey Ballet Company, the New Jersey Symphony Orchestra, the New Jersey State Opera, and the Theatre of Universal Images, Newark Boys Chorus, Victor Borge, Patti LaBelle, Teddy Pendergrass, Richard Pryor, James Cleveland, Iyanla VanZant, Kirk Franklin, Sinbad, Queen Latifah, Jimi Hendrix, Gladys Knight, the Temptations, the O’Jays, Jerome Hines, Beverly Sills, Roberta Peters, Leontyne Price, Robert Merrill, and on and on and on and on. The song never stops. And once you learn how to keep time with your feet, you won’t either. Evonne M. Davis and Emma Wilcox are working artists and co-founders of a Newark alternative arts nonprofit. Begun in 2003, Gallery Aferro offers exhibitions featuring local, national and international artists, a wide range of public events, a year-round studio residency program, educational offerings, group tours, a publication line, a gift shop and public art initiatives.